Create signature scenes in any room with this set of interlocking LED panels. From Hollywood sets to Sunday brunch selfies, everyone knows lighting is everything. 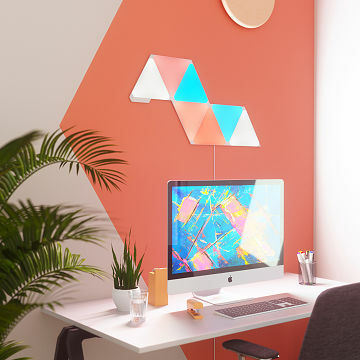 Create signature scenes in any room at home or in the office with this set of interlocking LED panels, which snap together to form an infinite number of geometric designs. The Rhythm Edition allows you to visualize your tuneage–literally–in gorgeous color displays. When sounds are played on a connected device, a built-in audio sensor instantaneously translates beats, sounds, and melodies to light signals, making the colors "dance." (We want to try it with "Flight of the Bumblebee."). The colors are also completely customizable, so whether you're simulating morning sun in the bedroom or illuminating calming greens and blues in the den to de-stress at the end of the day, you just became the lighting design master of your domain. Download the app to select colors, choose lighting animation, name and save custom scenes, and schedule different scenes to go on and off throughout the day. Starter Kit includes: 9 panels, 9 linkers for connecting panels to each other, 1 power supply, 1 controller unit, 9 sheets of stencil paper, and 28 pieces of mounting tape. Rhythm Edition comes with everything from the Starter Kit, plus the audio sensor. Visit the blog to read the full story behind this brilliant addition to our assortment. Gimmy Chu, Tom Rodinger, and Christian Yan are three adventure-seeking, life-loving, dream-chasing digital nomads with a simple aspiration: to make the world a better place. It wasn’t a new idea, or one unique to them. But there was a passionate, personal connection to it. The three designers met while building a solar-powered car on the University of Toronto’s World Solar Challenge team, where they realized that sustainability doesn’t have to mean compromise. The three went their separate ways after graduation to explore and grow in their different career paths, in IT, research and manufacturing, but reunited after a few years to explore their first passion of eco innovation. Starter Kit includes: 9 panels, 9 links for connecting panels to each other, 1 power supply, 1 controller unit, 9 sheets of stencil paper, and 28 pieces of mounting tape. Expansion pack includes: 3 panels and 3 links. I love how simple yet elegant this was as a gift ! Love how these lights change the color & mood to our chill room. We painted our walls white and are impressed with each use! Still deciding where to put this. Which lucky wall gets it!! The color tones and vibrancy are spellbinding. The variations and customizations make it so versatile and fun to experiment with. We have a large home with tall double height ceilings, white walls, and literally the entire space glows and takes on different moods depending upon the light color. May consider additional triangles to expand the lead get fixture. Highly recommend- enjoy!! I just moved into a new place and was looking for something to really spruce up the place. The Aurora is exactly what I wanted!! It's so easy to setup (took me literally less than 20 minutes), the display is beautiful and my home feels so much cozier and more beautiful with it. I come home and set it to a nice warm soft light to help me relax, or I set it to some funky colors when I have friends over. It's even great for yoga when I don't have time to go to the gym - I just set it to the 'inner peace' scene and it's perfect. Seriously, if you want something that will give your house an instant renovation without spending tons of money or time on installation, get the Aurora!